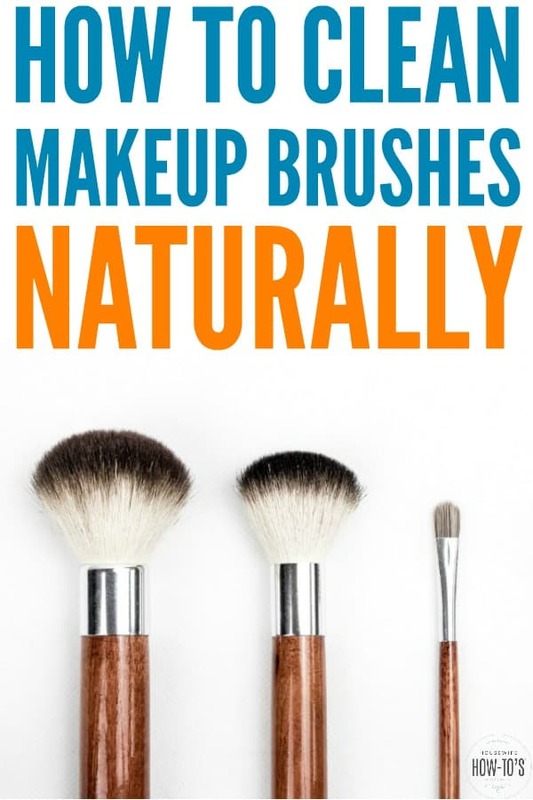 Learning how to clean makeup brushes naturally restores them to excellent condition, so your cosmetic shades don’t become muddied on your face. Regular cleaning also combats oil and bacteria buildup in makeup brushes — and we’re talking the potential for some dangerous bacteria here. That’s what a 27-year-old Australian woman learned when she lost the use of her legs and feeling in her lower body. The culprit? Her friend’s dirty makeup brush gave her MRSA. So, okay, you know better than to borrow your friend’s makeup brush. You still need to think about the connection between dirty makeup brushes and acne. Fortunately, it’s easy to clean makeup brushes and keep them in practically new condition. These are the makeup brushes that I use, and they’re fantastic. 1. Fill one jar halfway with warm water and add one teaspoon of Castile soap. I use unscented Dr. Bronner’s for this. Castile soap is natural and non-toxic, and since it’s oil-based, it does an excellent job of dissolving other oils thanks to that whole like dissolves like principle. Resist the urge to get the water too hot or it will begin dissolving the glue that keeps your brushes’ bristles in place. 2. Dip brushes in one at a time, swirling vigorously, so the soapy water cleans the bristles. After swirling a brush for 30 seconds or so, gently press the side of the bristles against the wall of the jar and twirl the brush in the water for 5-10 seconds to remove even more makeup residue. 3. Turn the faucet on and rinse the brush in fresh, running warm water for 5 seconds. 4. Gently press the bristles dry with a clean white washcloth. If you find there’s still makeup residue, repeat steps 1-3 above. 5. When the brush is completely clean, prop it in the second jar to dry with the bristles facing up. Allow makeup brushes to dry at least 12 hours before next use. 6. Once the brushes are thoroughly dry, fluff the bristles by tapping them against the back of your clean hand if needed. It’s better to keep a stash of replacement sponge applicators but, if you absolutely must clean them, here’s how. 1. Add 1/4 cup warm water and 1/4 teaspoon Castile soap to the small bowl. 2. Dip the sponge end of the applicator into the soapy water. Using your fingertips, gently squeeze the makeup sponge repeatedly to clean it. Do NOT allow the sponge to soak in the water or you’ll damage the glue holding the sponge in place. 3. Quickly rinse the sponge under a gentle stream of warm water then tap it against the edge of the sink to remove as much water as possible. 4. Carefully press both sides of the sponge with the washcloth. Take care not to pull or wiggle the applicator while you do this since the glue will be very fragile at this point. 5. Lay the applicator flat on a clean washcloth and let it dry at least 12 hours before use. Ideally, you should tap the powder out, or wipe the gel liner off of your makeup brushes after each use and clean them using the steps above weekly. For some of us, even a monthly cleaning would be an improvement. The important thing to remember is that your skin will pay the consequence of letting your makeup brushes build up too much oil and bacteria. So, if you’ve been battling breakouts but don’t know why, try cleaning your makeup brushes more often and see if that helps. Note: This article first appeared October 28, 2015. It has been revised and updated for republication. Haha I just joined this minute and already love the joints and helpful tips. Going to go look for castil soap today! Thank you for joining, Cherri! Hope you found the Castile soap without problem.